Stuffed zucchini blossoms make a delicious and unique appetizer. The flowers are filled with a 3-cheese mixture that is flavored with just a hint of mint, dipped in batter, and then fried. 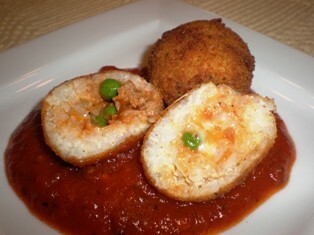 The cheese filling melts while the batter forms a light, crispy coating. To make them ahead of time, they can be stuffed and refrigerated; coat them with the batter and fry them right before serving. They should be served while still warm and crisp. If you are picking your own zucchini flowers, check inside the blossoms in case any insects have taken up residence. The female flowers eventually produce the zucchini, while the male flowers do not. You can use either for this recipe, but you may wish to allow the females to remain on the plant to produce the fruit. You can tell which is which by looking at the stem of the flower; the males have slim green stems and the female stems resemble miniature zucchini. The flowers are best used the same day they are harvested. If you don't grow your own, squash blossoms are often available at farmers' markets. In a small bowl combine the ricotta, mozzarella, Parmesan, and mint. Mix until smooth. Season with salt and pepper. Open the blossoms by gently spreading open the petals. Use your fingers to remove and discard the stamens inside the flowers. Spoon about 2 teaspoons of the filling into each blossom. Close the blossoms and gently twist the ends of the petals to seal in the filling. Heat about 1/4-inch of olive oil in a wide saucepan over medium-high heat. You can also fry them in a deep-fryer. In a small bowl, combine the flour and salt. Add as much club soda as needed to make a batter that is about the consistency of pancake batter. 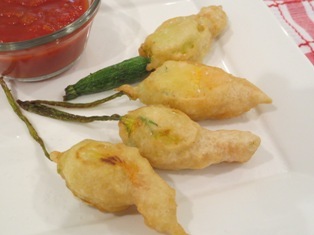 Dip the stuffed zucchini blossoms in the batter and allow any excess batter to drip off. Fry for 1 to 2 minutes, turning occasionally, until lightly golden brown. Transfer the cooked blossoms to a paper towel-lined plate to drain. Sprinkle with salt and serve with your favorite marinara sauce. The mesh basket allows the food to drain while the clamp helps to take the food out more easily. Enjoy healthier versions of your favorite foods by frying them with a tablespoon or less of oil.